In Wisconsin, Ospreys were listed as endangered in 1972. Their status was lowered to threatened in 1989 and they were delisted in 2009. Although Ospreys are no longer endangered or threatened, they are relatively rare in this part of the state. This nest on Big Muskego Lake is one of about five active Osprey nests in the southeast Wisconsin region. Following the restoration of Big Muskego Lake in 1997, an Osprey translocation project was implemented to reintroduce the species to the lake. Adult Ospreys were observed around the lake in 2003 and an Osprey pair successfully nested in 2005, fledging one young. The species went on to fledge two young in 2006, 2008, and 2009. The future looks good for the local Osprey population, as young hatched here should imprint on the area and return to nest as adults. 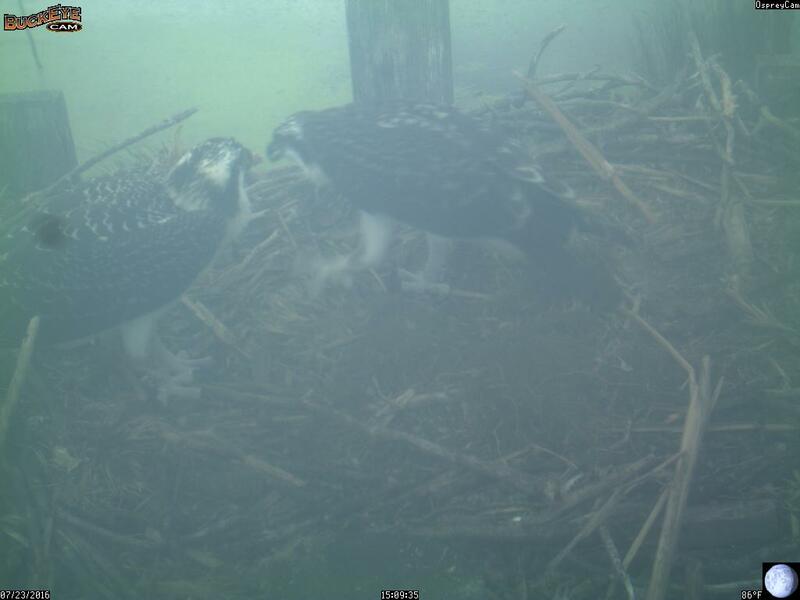 Since 2009, a remote web camera has been aiding us in observing nesting habits of the local Osprey. The camera is setup on a nesting platform located in the cattail fringe of Big Muskego Lake. Pictures are triggered by movement on 3 minute intervals, be sure to check back often during nesting season.